There is a new Drug on the street known as Soy Sauce which kicks you across time and through dimensions, but some who come back could no longer be called human. David Wong and his best friend John (those names are fake) are ready to tell you about the sauce, about Korrock, about the invasion, and the future - a pair of college dropouts who can barely hold down jobs. Can these two stop the oncoming horror in time to save humanity? No. No, they can't. There is a very strong voice present within John Dies at the end that contains a unique mixture of horror and humour, a smooth quality that is completely unique, very fresh and feels somewhat like the fictional lovechild of Robert Rankin and Douglas Adams. The story itself is narrated in the first person as David explains to a reporter the whole crazy and difficult to believe tale and the author makes it clear that Dave is at best an unreliable narrator - something that manages to complicate matters even further. The prose itself is incredibly well written in a confident voice that manages to remain both jocular and yet disturbing at the same time (no easy feat). The plot is fast and more tangled than a contortionists annual twister competition and there is plenty of action, suspense and quite sickly happens - this isn't a novel for the weak of constitution. The author manages to play with reality too, describing a lucid vision of hell and managing to cast doubt on the very meaning of existence. More than that though is the way the author manages to build the tension in the story, it's actually pretty freaky and held more power than many Dean Koontz or Stephen King novel's I have read. The fact that the original story was written in instalments also adds something to the novel, it's like there are three equally impressive endings within one novel. Since reading the book I've learned that it's been made into a movie that's due to be released in 2012 (presumably before the apocalypse) and I can't wait to see how it is transferred to the big screen. I always knew there was a reason why I held reservations about soy sauce and every time I see a bottle I will shake - distance myself from that strange substance and remember the tale of Dave and John. 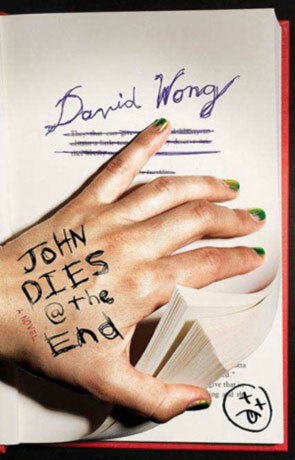 John Dies at the end is a disturbingly diverting, boisterous book with a rare blend of dry, twisted humour and effective horror that is both fantastic fun and scary in equal measure. Written on 5th August 2011 by Ant.